Indian food is my nemesis. Don’t get me wrong, I love all vegan Indian food—I’m just lousy at replicating it. More than once I’ve tried to replicate various dishes at home, but it always ends in disaster. I follow instructions exactly, use high-quality spices (and even the prepared ones that have everything mixed together for you with instructions) and BAM! instant straight-to-the-garbage-disposal-type failure. However, I’ve had vegetable pakoras on my mind lately after having some amazing ones at an Indian restaurant a few weeks ago and, given that pakoras are deep-fried, I decided to take a stab at recreating them at home. (Although I may be lousy at replicating Indian dishes, I do know a thing or two about deep-frying. 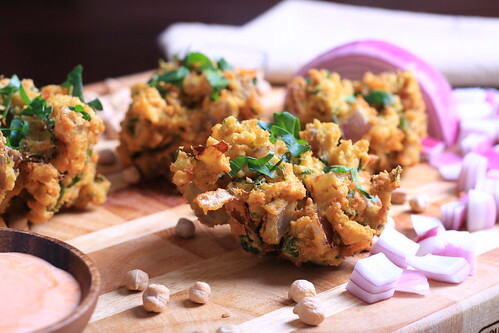 )Because the recipe below is far from an authentic Indian pakora recipe (I used bread flour, unsweetened almond milk and sriracha), I am calling these fritters instead. The sriracha and curry powder combo tastes heavenly together here and the fritters themselves are crispy, soft, savory, subtly spicy and completely addictive. Place half of the chickpeas into a bowl and roughly mash them with a fork. Add in the rest of chickpeas, parsley, chopped onion and the flours. In a measuring cup, add the milk, Ener-G, tahini and curry powder. Whisk until well combined, then add to the chickpea mixture. Mix everything up, cover and place in the refrigerator to chill for at least an hour. When you are ready to fry, place plenty of oil into a small saucepan over medium-high heat. After about 8-10 minutes, it should be ready. Throw a pinch of the batter into the oil—if it sizzles immediately, you are ready to fry. Stir up your chickpea batter with a strong fork. Scrape out a bit of the batter, keeping a messy shape to it. Slowly slide it into the oil and fry until golden brown, about 5 minutes. Remove with a heat-resistant slotted spoon or tongs and place on paper towels to drain. Sprinkle it with some salt immediately after taking it out of the oil. To achieve crispy fritters, only fry one or two at a time—if you add to many, it reduces the temperature of the oil, leaving you with soggy and oily fritters. Serve immediately with the sriracha-vegenaise sauce. Oh golly, these look delish! Interesting idea! I have a bagful of chickpeas on hand and all I've been making with it lately is chana masala. Can't wait to try this out. Curious about your struggle with cooking Indian food – what exactly goes wrong? I'm guessing over here but it might have to do with the cooking time of the spices. Whole spices like mustard/cumin seeds need to be added to very hot oil and allowed to pop before anything else is added to the oil. Is that it? Indian cooking is perhaps easier to figure out by watching that reading recipes. I hope you find your way around it. Good luck! The Steaming Pot: it could be that, I'm not sure! There is a restaurant nearby that offers Indian cooking classes … perhaps I need to signup? Okay…I recently wrote you a long email of my gratitude to your recipes that have made my transition into a 90% vegan lifestyle a delight. (sorry, I have a love affair with cheese that would never permit that 100%…unless you can duplicate all the exotic cheeses of Europe). I was so enthralled with those two recipes alone that I am making a point to try at least one of your vegan recipes a week. Weekends, I succumb to a more lenient vegetarian diet, and permit eggs and cheese if need be. But the curious thing, is that after eating clean vegan for nearly 2 weeks, this weekend I have felt like absolute crap having indulged in non-vegan pizza, jalapeno poppers, and a creamy cheddar/ale soup that tasted delicious- but left me reeling in stomach pain and I have felt out of sorts for over 24 hours. Needless to say- tonight I came home and thought to try another of your recipes, as I was in a snacking mood, and it is after midnight. I chose these curried fritters. I am in near tears, I am so elated…and let me tell you that I enjoy cooking Indian food and also travled abroad there for over 3 months…and these….are AMAZING! I wonder now if it will be possible for me to become 100% vegan (even though I am Italian…hello!) This is amazing! I told my husband that your recipes are making all other non-vegan food seem inferior to my palette. Wow! Thank you for your comment, Leila! I'm thrilled that my recipes have been of use to you, and thank you for your incredibly kind feedback. When I made the transition from vegetarian to vegan, I experienced some of the same things that you described and only found out well after I was totally vegan that it was due to lactose. As long as you consume lactose, your body is used to it, but once you significantly scale back or abstain from it completely, then reintroduce it, you'll experience these symptoms. Your body is basically becoming lactose intolerant! could these be pre-made and frozen? Sinead, I don't see why not. If you make/deep-fry then freeze them, I would just allow them to come to almost room temp before refying/crisping them. Alternatively you could just make the mix and thaw before frying as usual. I haven't tried either of these, but theoretically they should work. Good luck! Erin! Everyone! These were DELICIOUS. I had some leftover avocado sour cream from your buffalo chickpea taco recipe (which we’re also having tonight – this was the appetizer), and that was great with them. My BF whipped up some sriracha mayo… to which my teen added ketchup. (?!) We scoffed, but tried it and it was out of this world. The sweetness of the ketchup really set things off. This is the best appetizer I’ve had in a very, very long time. My entire family of omnis loved them immensely. Thanks for helping us switch to a kinder, healthier lifestyle. Love your recipes!